The beginning of the month is a time for announcements and recognition here at TrueLogic, and last week was no exception. We announced the launching of our March promo for one of our brands on top of all other announcements that were made during last week’s Town Hall. Let’s revisit Town Hall first and make our way towards the March promotion in today’s weekly recap. The Content Department was at the center of the spotlight during last week’s Town Hall meeting. They received good feedback from a client who has also expressed their love for working with our team. The Content Quality and Quantity Rockstars were also announced that week. Congratulations to Justin, Billy, Rom-Jaye, Jayson and Bjorn for making it to the Quantity Rockstars list, and to Jay, Aileen, Rom-Jaye and Justin again, and Khryss for being the Quality Rockstars for the month of February. Rom-Jaye was also named as the overall February Rockstar. Keep up the good work and congratulations everyone! 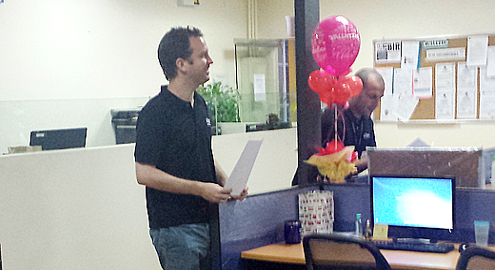 We also celebrated birthdays, regularizations, and anniversaries last week. 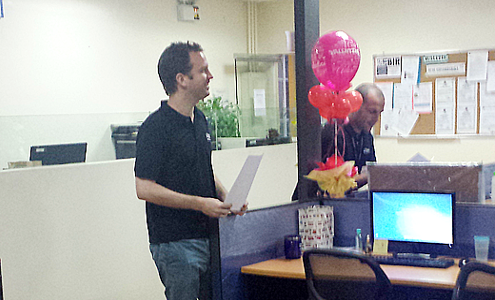 The entire TrueLogic team greeted Jonathan a happy birthday this week. Justin has finished his six-month probation period and is now a regular employee, while Pam, El and Jem celebrated their anniversaries with us. We’re looking forward to your contributions to our growing organization as you continue your time with us! Watch out for next week’s Town Hall recap for the list of winners! We take pride in the in-house technology that we develop to make our processes better. One such technology is our Compass system, which we successfully launched a few weeks ago. We’re still beta testing the integration of some of its features into our daily company routine, and it was announced last Friday that we’ll be starting to use Compass for timekeeping this week. We’re looking forward to the success of this transition and we’d like to congratulate once again our Dev team for creating this advanced technology. It’s exciting for us to think of what technology we can expect to come next from this wonderful team. This past week, we also launched our March Madness Promo for our SEOReseller.com brand. It’s a limited time offer exclusively for new clients where we give $500 credit free for every new client who purchases a total of over $2,000 worth of products / services. This limited time offer runs all through the month of March. Full details can be found at SEOReseller.com’s official blog. This sums up last week’s recap. Check back again next week for more updates and company news as I recap this week’s highlights!